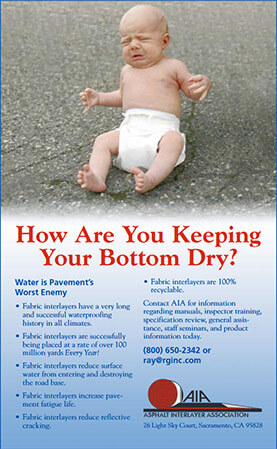 Water is known to be the source of premature deterioration of roadway sections 80% of the time. A primary source of water getting to the base aggregate is water that passes through the asphalt. The use of paving fabric or paving mat interlayers in prior to placing chip seals is a very cost-effective way to provide a new wear surface and provide waterproofing. An important benefit is the retardation of reflective cracking present in the underlying asphalt concrete pavement. Interlayers always improve the performance of the wear surface placed over them. The GRCS process is intended for roads that have a sound structural section, in other words, they do not deform under load. GRCS extends the life of the existing asphalt pavement by providing an all-weather surface-wearing course with improved skid resistance while improving the load bearing capacity of the road due to the drying of the base aggregate by blocking all water penetration through the surface. All new HMA/WMA should be sealed to extend the asphalt’s life. This can occur as early as 6 months after placement but certainly within 3-5 years. The interlayer must be completely saturated and bonded to the underlying asphalt concrete pavement by applying a liquid asphalt tack coat, such as paving asphalt, prior to placing the interlayer. Emulsions are NOT recommended to be used to bond and saturate the paving fabric. Geosynthetic placement with chip is not recommended at the following locations: l) the bubble portion of cul de sacs, 2) intersection radii 3) the last 100 linear feet approaching a high-volume intersection that requires traffic to stop and 4) in areas where subsurface water penetrates the existing pavement from underneath. Please refer to AIA Standard Guidelines for binder and or manufactures recommendations. A chip over a geosynthetic can be successfully accomplished with or without the use of sand after placement of the paving fabric. NOTE: Sanding is very beneficial in seating of the geosynthetic in to the asphalt binder. It serves as a bond breaker between vehicle tires (either construction or public vehicles) and any asphalt binder that may surface on top of the interlayer. Without sand, the tires can pull the saturated geosynthetic from the pavement. Therefore, if sanding is not to be used, the complete embedment of the geosynthetic must occur during geosynthetic placement or with subsequent rolling prior to placing the chip. If sand is not used, it will be necessary to use a parting agent on the tires of the pneumatic rollers. Chip Seal Materials — AIA always recommends a double chip seal. The second chip used is to be of smaller size than the first. Such as 3/8″ with 5/16″ or ¼” or 5/16″ with ¼”. The second chip locks in the first and provides a finished surface much more appealing to the traveling public. The chip should be placed in conformance with Agency requirements for double chip seals. 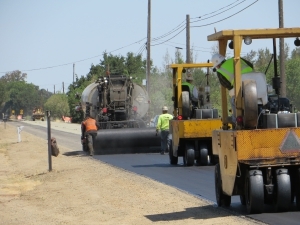 Paving asphalt shall be applied only when the atmospheric temperature is 600F and rising, and atmospheric temperatures are not expected to reach 1000F that day. The pavement surface must be dry and shall be 55 OF and rising. The work should not be performed if inclement weather is predicted from the time geosynthetic placement begins to 24 hours after chip sealing is completed. It is also recommended the ambient/pavement temperatures normally required of chip seals are also present. If not, geosynthetic placement is not recommended if ambient /pavement temperatures cannot be obtained for each phase of the operation (geosynthetic & chip seals). Liquid paving asphalt for tack coat shall be applied between 2900F and 350 0F. The application rate of paving asphalt, including overlaps, shall be normally the minimum as specified by the manufacture. This will vary with interlayer used. The application rate of the tack coat needs to be sufficient to ensure the geosynthetic is fully saturated with bitumen (liquid paving asphalt) and bonded to the existing surface, but not so heavy that there is free bitumen on the surface of the interlayer. This is a critical judgment decision that must be made as the project proceeds. Varying quantities of cracks, pavement roughness and porosity of the existing asphalt will require varying applications rates of tack coat. If insufficient tack coat is applied the interlayer will not be fully saturated. Binder applied for the chips will therefore be absorbed into the interlayer and chips will not be adequately adhered. In contrast, excessive tack coat application may result in pick-up by construction equipment and vehicles used during the seating of the fabric or the construction of the chip seal and bleeding. Excessive tack coat application may also result in the fabric moving during hot weather when the asphalt binder typically softens. The interlayer must be completely embedded in the tack coat immediately after the tack coat is placed. It is imperative that broom pressure must be applied uniformly across the full width of the interlayer being placed. If paved shoulders exist, the interlayer shall be placed on shoulders before placing the interlayer on travel lanes. Longitudinal joints shall be placed in the same location as travel lane delineation (striping) when possible. When desired, the interlayer and the first layer of a double chip seal can be held back 4-6 inches from all valve covers and curbs to provide a smoother transition. Prior to beginning secondary rolling operations, the interlayer should be sanded by a mechanical sand spreader at a uniform application rate of 2-4 pounds per square yard. Sand should be rolled immediately with pneumatic-tired rollers to insure complete seating of the fabric in the fabric binder. Rollers shall be pneumatic tired and should not exceed speeds of 5 miles per hour during all passes. Rolling should begin immediately behind [no more than 50 feet] the interlayer placement and/or the mechanical sand spreader (if sand is applied). Enough rolling has been done when the texture of the underlying pavement surface is visible on the surface of the interlayer. Sand shall be removed immediately prior to beginning chip seal operations. Shingling” of all rigid interlayers required on horizontal curves.